Aztec Diamonds is a 30 Paylines and 5 reels slot game presented by NextGen gaming Limited. Total coins for the game are 30 and coin size ranges from 30p per spin to up to €£90 per spin. The slot gives you an opportunity to win a good 500 times on your total stake as jackpot. There are 3 bonus rounds available during the game. One of the bonus rounds is Free spin feature which could get you 6 to 9 free spins. Play Aztec Diamonds video slot using any of your devices including smart phones, desktop or tablets using real money Nextgen casino sites. Aztec Diamonds slot has 4 fixed jackpots for you and the game is set in a lava-filled volcano. You will see A, K, Q, J, 10 and 9 playing cards symbol on the reels of the game. Some more symbols like 4 animal Aztec signs are also available on the reels, where the bird symbol is the highest paying symbol, giving you 16.66 times on your total stake for 5 symbols across your Payline. The idol is the will symbol in this game which appears on reel 2, reel 3 and reel 4 and 5. The wild replaces all other symbols on your screen except the diamond and the volcano. 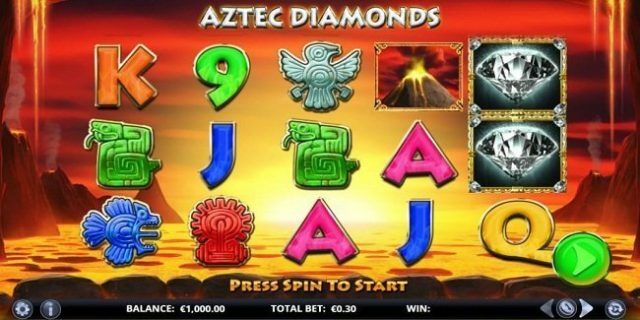 One of the features of Aztec Diamonds slot game is the Jackpot Diamond feature, which comes in to play when a player lands 6 or more diamond symbols on the reels. In that case, the player will be rewarded 3 re-spin chances and at the end of these re-spin, you will receive cash prizes. Another feature of this game is the Jackpot Diamond Expanding Reels feature. This feature comes in to play when you land 4 diamonds in all 4 corner positions of the reels. In this case, the re-spin will reset and you will get 3 re-spins. Here you could get/win up to 250 times on your total stake according to your grid positions and diamond appearance.